If you are a Chrome user (which I hope you are!) then perhaps you would like to learn how to "pin tabs" so you no longer have to reopen the same tabs each time you open chrome. Chrome is such a beast because it is built with efficiency and speed in mind. I like the "pin tab" feature because each time I open Chrome, my TweetDeck and my Drive are open and ready to go, no need to waste time and energy open those tabs every time. 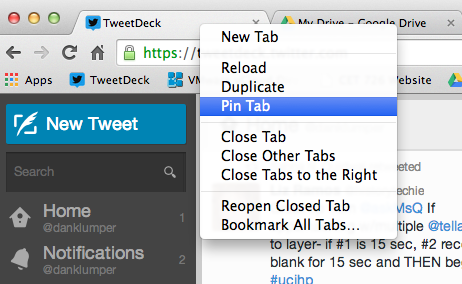 Pinning Tabs is a breeze, just follow the screen shots below. The only question is, what tabs will you pin? Be careful, those pins are sharp. Right click the tab you want to pin and this drop down menu appears. Simply click "pin tab" and you are done! After you have "pinned" your tabs, then they will shrink into mini tabs, so you might have to be more accurate with your mouse, but at least you saved a bunch of time not having to actually open them yourself!